i have taken a strong voice and told her no and use my hands on her hind and neck but she doesn't stop, please help as i don't want her to be aggressive at such a young age and for this behaviour to get out of control. At 9 weeks your pup has hopefully just left the litter. She would have learned from mom & sibs how hard is too hard to bite. When she nips, YELP LOUDLY! and then turn away for about 1 minute. This is what the pack would do.Puppies want attention, and to be part of the pack. Being ostracized is the last thing they want. Make sure everyone in the house does this & she should stop. I never advocate any physical corrections in puppies this young, especially gsds. They are quite sensitive and do NOT respond well to physical corrections. They may indeed stop the behaviour, but it can lead to trust issues later and further behaviour problems. My GSD learned the first time I did this. When she starts to nip grab her muzzle and hold her mouth closed for a few seconds. It won't hurt her, but they hate it. My boy learned immediately. I swear he was over it in one day. I did not come up with this technique. I learned it by reading the Monks of New Skete, "How to Raise a Puppy." 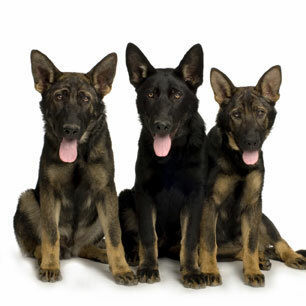 Highly Recommend you do too if you want a happy life with your wonderful GSD.